Another uneventful work week has passed as we race towards the start of this year’s cruising season. I have just four more working days until we set off on a mini cruise before returning to base and swapping boat for bus and our two week motorhome trip around the Scottish Highlands. Cynthia wanted to head south down the Oxford canal to Oxford and some gentle and cultured exploration. Unfortunately, winter stoppages have thwarted that plan, and our plans to cruise most of the other routes available to us from our base on the Grand Union canal near Napton junction. We wanted to moor at Great Haywood so that we could explore Cannock Chase. We can’t. We considered heading northwest along the Grand Union canal towards Birmingham. Work on the Hatton flight has stopped us dead in our tracks. We thought about heading the other way along the Grand Union but, once more, stoppages won’t allow us to do so. We’re going to take the only route open to us at the moment. We’ll brave the Braunston, Crick and Husband Bosworth tunnels, two flights of staircase locks, a couple of swing bridges and the occasional pub on our way to Market Harborough. After four trips there last year it’s a very familiar route, but it’s a beautiful and peaceful journey. We’re looking forward to it very much. On Friday we enjoyed a very welcome break from stationary monotony on an early season discovery day. The day was dry but chilly. Climbing into the cabin’s warmth for morning coffee and then lunch two hours later was very welcome indeed. Today is much warmer but very windy. White topped waves marching down the canal have created an unwelcome challenge for some boaters descending the Calcutt Flight behind us. The day is mild but the forecast for the coming week is for a series of sub zero nights. The coming cold spell, and my chilly Friday discovery day, has prompted me to write about keeping warm during winter months. A common question asked of boaters is how they cope with steel boats in frigid waters. The common misconception is that life on board during the short, dark days of winter must be very cold and unpleasant. My first winter on board was certainly very cold. Mind you, that particular year, the winter of 2010/11, everyone was very cold. It was the coldest winter ever recorded. My own external thermometer, stuck to the glass of my office space window, recorded minus eighteen degrees one night. I woke the following morning in a sub zero bedroom with a quarter of an inch of frost on the engine room’s internal cladding. I wore two fleece tops, a fleece hat and gloves at all times inside the boat, even when sitting in front of the blazing stove. The boat sat immobile on a marina frozen under five inches of ice. One afternoon I walked on the ice around the boat. Nothing moved on the canal network for over six weeks. Live aboard boaters unfortunate enough to be caught on the ice away from service points had to ferry shop-bought water along the towpath to their freezing homes. Water points were often frozen. Many boaters had to use public facilities to wash dirty and very cold bodies. That winter wasn’t particularly pleasant. This is my sixth winter. I have continuously improved the boat since I moved on board in April 2010. I’ve added more insulation and another heating system, eliminated a serious damp problem I had at the rear of the boat, eliminated draughts through side doors and hatches, improved heat distribution throughout the boat, and experimented with secondary double glazing. All of the improvements have helped, but so have much milder winters since my baptism of ice. You probably won’t endure a winter quite as cold as my first on board, but if you’re not prepared for the colder months, life afloat can be less than pleasant. Preparation is the key to waterways success, so here are a few pointers in the right direction. For us, a major source of heat loss is through our windows. The windows are the original set installed in 1977 when the boat was built. They’re not very good. They have rectangular hopper panes at the top which can arc inwards twenty degrees to allow ventilation. The problem is that they now don’t keep out draughts on windy days. They are also single glazed which means that they are very poor insulators. There are ten windows and three portholes so there’s a considerable surface area leaching heat out of the boat. I tried secondary double glazing last year. The 4mm polycarbonate panels were very effective once I managed to secure them to the window frames. They came with a magnetic tape kit but the magnets weren’t strong enough to keep the panels in place. I tried velcro too but the panels still fell off. The effective solution was to use the velcro and also screw the panels into the window frames. This solution created another problem. Because the aged windows had loose catches securing the hoppers, every time we cruised the vibration would shake some of the hopper panes open. Closing them again was a very painful exercise. We had to unscrew the secondary glazing panels, pull the panels off the velcro, close the hopper and then put everything back together again. Securing the window panels was a pain and removing them to constantly close hoppers was a bigger pain. In the spring when the weather improved, trying to find somewhere to store ten large and easily scratched pieces of plastic was the final straw. They had to go. This winter has been exceptionally mild. Very wet, but quite warm. We haven’t bothered with secondary double glazing, but if we are on board in more severe winters in the future we will try secondary double glazing film. It’s a low cost heavy duty cling film which is stretched over the window frames and then warmed with a hair dryer to make it taught. Because of the low cost it can be discarded after each season’s use. The heart of any live aboard boat is its solid fuel stove. It’s a completely dependable heat source. My own stove was installed when the boat was built in 1977. In thirty nine years the flue has been replaced once and the stove glass has been changed periodically, but that’s it. There are no moving parts to break down when we need them most, and very little servicing to do. My stove isn’t a particularly good model. The Torgem, or Torglow, I can never remember which it is, has quite a small footprint so, unlike the popular Morso Squirrel stove, I can’t use the hot top plate for heating a pot or a kettle, or for powering an Ecofan to push the stove heat towards the back of the boat. My stove has a back boiler which used to feed three radiators fitted on the boat’s starboard side. The gravity fed radiators weren’t very effective. By the time the stove’s hot water had trickled forty feet to the last radiator in our bedroom, it had pretty much given up the will to live. The radiator, at best, was luke warm. Consequently the bedroom was too cool to use for anything other than sleeping, insulated by a thick duvet. Because I couldn’t use an Ecofan on my stove I installed a 12v fan in the centre of the cabin roof. The fan pushed the stove heat down the central passageway and raised the temperature in the back cabin by four or five degrees. We always burn coal briquettes. Some boaters claim that they can heat their boats effectively using wood that they find on or close to the towpath on their travels. I have never found wood to be either effective or practical. Wood needs to be seasoned, usually for a year or more, before it is dry enough to use as an effective fuel. When first cut, oak’s water content can be as high as 50%. Ash is usually a little less, but both need to have a water content of less than 20% before they will burn properly. When wet wood is burned, more energy is used to evaporate water than generate heat. The wood sweats rather than burns which produces flue blocking tar and a nicotine-like stain from the chimney down the boat’s cabin side. When I was working at Calcutt Boats I had access to all the wood I wanted. One of my jobs was to manage the site’s young woodland. I had to fell twenty year old ash and oak to thin out the woodland so, over a two year period, I stockpiled four or five tonnes of seasoned logs. Log burning still didn’t work for me. My small stove needs feeding too often if I’m burning wood. A stove full of coal briquettes lasts for ten to twelve hours. A stove full of logs lasts no more than three hours. A stove full of logs doesn’t last the night. A stove full of coal does. Even if I could adapt to feeding the fire more frequently I couldn’t carry enough logs with me when cruising. I can comfortably carry enough coal to last me 7-10 days decanted into leak proof plastic boxes stored under the cratch cover on the front deck. I can’t store bags of coal on the boat roof like some boaters because, after over plating the original wooden cabin with steel, the boat is a little top heavy to say the least. Carrying enough wood to last me a similar time is out of the question. My stove does a reasonable job of heating the boat, but it’s not quite enough during the winter months, especially if I’m sitting motionless for hours on end typing in my office space towards the back of the boat. To improve matters I fitted a diesel central heating system in November 2015 . I had the stove’s back boiler disconnected, the old radiators removed and three new radiators fitted down the starboard side, plus a large one on the port side under my office desk. The Webasto Thermotop C system has made a real difference on board. We have been off grid on all but a handful of days since last April, including all of this winter. The last few months haven’t been as cold as previous years, but they’ve been cold enough to warrant having effective heating on board. I am now always very comfortable in my office space. The bedroom space is much more pleasant too. We have a television and Blu-ray player installed there which we often use to watch films in the evening. Now we can watch them in comfort. Damp can often be an unpleasant problem on board during the winter months. Poorly heated, insulated and ventilated spaces often suffer condensation problems. During my first two years on board I endured a very damp bedroom. The bedding was often so damp it was almost wet. Over the following four years I made many changes to improve the situation at the back of the boat. I added more insulation to the hull when I over plated the cabin. My polystyrene insulation isn’t the best form of boat insulation. Sprayfoam is much better but I can’t change my polystyrene now. It could be better but it’s not bad. I also fixed a thermal blanket to between the bed and the hull beneath the gunnel, made sure that all the internal doors were open to allow heat from the stove to reach the bedroom and, last November, installed a diesel central heating system with a large radiator fitted at the back of the boat. I also ensure that my roof vents remain open at all times to allow moisture laden warm air to leave the boat. The bedroom, and the bedding, is now dry and warm. 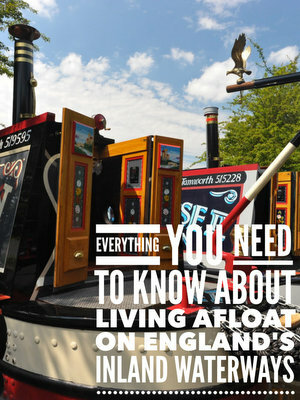 Most narrowboat floors aren’t insulated effectively or at all. My floor is typical. Steel bearers run over the base plate from port to starboard. Ballast sits between the bearers. I have steel ingots. Many boats have broken paving slabs. Marine ply flooring is fitted over the bearers. That’s it. There’s roughly 75mm of icy steel and damp ply between the soles of my feet and the canal’s frigid waters. Air trapped at the bottom of the cabin close to the floor is unpleasantly cold. If I walk through my boat in bare feet I feel the cold very quickly indeed. Carpet can be fitted to help insulate the floor but then there’s a new problem to deal with. Carpet was fitted in my boat when I moved on board six years ago. It wasn’t pleasant. The threadbare beige covering was a dirt magnet, especially with two dogs on board. Hallway carpets see the most wear in a bricks and mortar home. A boat is all hallway so flooring throughout needs to be hard wearing. I fitted oak effect laminate flooring three or four years ago. It looks good and is very easy to clean, but it isn’t a good insulator. Both Cynthia and I wear Crocs when we are in the boat. Their thick rubber soles are wonderful insulators. Crocs keep our feet warm but if we’re sitting for long periods, our legs are still cold if we have our feet on the floor. The solution is to sit with our feet up on our L shaped fitted lounge seats. Winter cruising can be a very cold affair for even the hardiest of souls. I always ask my discovery day guests to pack plenty of warm clothes. Not all of them follow my advice. On a chilly day last winter, my discovery day guest was a middle aged farmer. He had been a farmer all of his working life. He was used to being outdoors in all weather. The cold didn’t worry him at all. He wore a padded shirt and heavy duty sweater for our seven hour cruise. He also wore a fleece hat. He didn’t bring a coat. Before we set off I asked if he had a coat in his car. He told me he didn’t need one because he was capable of dealing with anything the English winter could throw at him. We set off with me wearing several more layers than him, including my bright yellow Guy Cotten waterproofs. We weren’t expecting rain, but the thick plastic smock top and bib and braces trousers are a very effective wind barrier. What the farmer hadn’t considered was that, unlike his normal working day around the farm, he was going to spend seven hours standing still on the back of a boat. His working days usually involved plenty of heat generating activity. Steering the boat didn’t generate any heat at all. We had to cut the cruise short and head back to base. He was mildly hyperthermic. I felt that he wasn’t getting as much out of the day as he should, so as we moored I asked him what he would like to do with his remaining time with me. He told me that all he wanted to do was to climb into his car, turn the heater on full blast and wait until he melted. A decent hat makes all the difference. The fleece hat I used to wear worked reasonably well as an insulator, but wasn’t a patch on the aviator/trapper hat I wear now. They’re very popular on the inland waterways. There’s a wide selection available here. Warm footwear is also very important. Walking boots are good insulators, but they aren’t very practical on board. They’re a real pain to take on and off, so for frequent short trips on and off the boat they’re a real nuisance. I used to wear Wellington boots for wet weather cruising. My feet stayed dry but they were always cold. Cynthia introduced me to Muckboots. They’re wonderful. The neoprene boots keep my feet toasty warm. The boots are comfortable too. I have driven a car for two hours while wearing them and haven’t suffered any discomfort at all after five or six mile hikes. It’s an extreme solution for dealing with dreary winter weather, but it’s something Cynthia and I are considering seriously. We’re thinking about buying a motorhome so that we can spend our winters exploring the south of Spain. I love living afloat now as much as I did when I first moved on board six years ago. I certainly don’t want to live in a bricks and mortar home. I want to continue exploring the waterways for as long as I can, but I’m not a big fan of cold and wet weather or inland waterways stoppages. Winter stoppages are a real frustration. CRT do a marvellous job keeping the 200 year old waterways network in working order. Essential maintenance to locks and bridges mean that sections of canals and rivers sometimes have to be closed. The most practical time to close them is when boaters least want to use them, so all scheduled stoppages are done over the winter months. Providing you wear appropriate clothing winter cruising is wonderful. You normally have the waterways to yourself and tranquil moorings are plentiful. The problem is that you can’t travel very far. Of the five directions I can head within a couple of hours cruising from Calcutt Boats, four have stoppages on at the moment. Winter afloat, even for continuous cruisers, is a waiting game. Waiting for warmer weather, and waiting for the waterways to open. We would both like to do our waiting somewhere warmer. As we descend the final steps of winter and slide into spring, there are many plans in the making and they are all exciting! Next weekend with tickets in our hot little hands, we head to Birmingham for the Motorhome show. This will be a first for both of us, and we are excited to see what’s out there and to talk with knowledgeable people. Paul has really been hitting the books and as I write this, he has already devoured 3 books on the subject. We are in savings mode (except for the odd DVD purchase here and there), and are serious about tucking away our pounds, so we can make this motorhome a reality sooner rather than later. We are of course hoping the Vermont house will sell and we can move ahead with our plans even quicker. With the above in mind, I made contact with my real estate agent a few days ago. Seems as though this has been a mild winter and she is actually showing houses, something pretty much unheard of in Vermont at this time of year. If the weather holds the house will be cleaned and ready to show in March. We are keeping our fingers crossed that the house will go quickly (I lowered the price once again), and it would be absolutely spectacular if it did, and I could close and put it all behind me. Our wedding date of 1 April is fast approaching, and we are finalizing all of our plans. We are both really happy that we will be spending the two weeks around the wedding date in a rented motorhome. We plan to explore the coast as much as possible and pray to the gods for fair weather. It will be a wonderful introduction to living aboard a “land yacht” and we will learn a lot along with seeing many beautiful vistas. Paul’s job comes to a close this coming Thursday and then we will make our way back onto the waterways for a couple of weeks. We were planning to head towards Oxford, but found out there are stoppages along the way, so unfortunately that is out. I have faith we will come up with some delightful destination—we always do. Even going back to our Christmas destination, Market Harborough would be just fine. I wouldn’t mind at all returning to Veneto’s and departing from my diet to indulge in a bowl of my favorite Movenpick ice cream!